Pulsars are magnetised spinning neutron stars that emit a beam of electromagnetic radiation along their magnetic axis (see an artist impression in fig. 1). Depending on their alignment, to an observer on Earth they may look like a beacon emitted by a lighthouse. Because of their compact size, of the order of 10Km, these objects rotate very fast with typical periods of less than a couple of seconds. Although the pulses emitted by a pulsar can be quite irregular and show a very clear deceleration trend, a class of pulsars with periods of the order of milliseconds and extremely stable pulses over periods of the order of billions of years has been identified. The details behind the mechanism involved in the formation of these so-called millisecond pulsars are still not completely understood, but it is suspected they are formed in binary systems when an old pulsar with very little of its rotational energy left, starts accreting large amounts of mass from its companion star. The accreted mass will thus transfer angular momentum to the neutron star, therefore “recycling” the pulsar and giving rise to a very stable rotation that can continue for billions of years. Millisecond pulsars are so stable that at some point it was believed they could compete for accuracy with the most accurate clocks on Earth. With the advance of clock technology this is no longer true (fig 2) but, fortunately for us, that is not the end of the story regarding the use of pulsars as clocks. 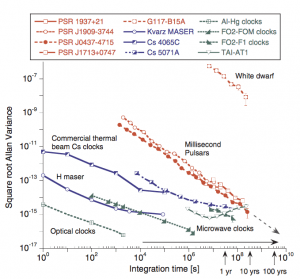 Unlike atomic clocks whose useful lifetime hardly exceeds 10 years, pulsar clocks will continue to operate for millions to billions of years and they could therefore be used for navigation far from the earth. Pulsar timescales are therefore still worth investigating and that is the goal of PULCHRON, a project funded by NAVISP involving a partnership between GMV, the University of Manchester (UoM) and ESA. Pulsar observations performed by 5 European radio telescopes participating in the European Pulsar Timing Array (EPTA) and provided by UoM, allow the PULCHRON team to investigate how to build a stable timescale combining pulsar data with conventional timescales, such as UTC. 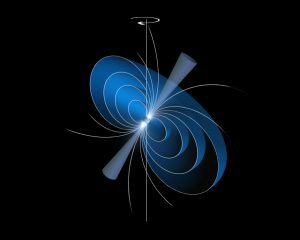 Using the time of arrival (ToA) of the pulsar signal, frequencies and drifts for each pulsar are calculated with a model that takes into account pulsar physics, propagation of the signal in the interstellar medium and antenna characteristics. Once the frequencies are known, the PULCHRON team calculates the timing residuals, the differences between the ToAs and the values predicted by the model, for each pulsar. With the pulsar characteristics and the timing residuals, PULCHRON will then investigate both the implementation of a physical timescale (using the pulsar data to steer the output of an hydrogen maser) and the construction of a composite time scale (using the pulsar timescale and satellite and ground based clocks). The first will demonstrate the feasibility of using a pulsar timescale to monitor a “conventional” clock, in this case an hydrogen maser. 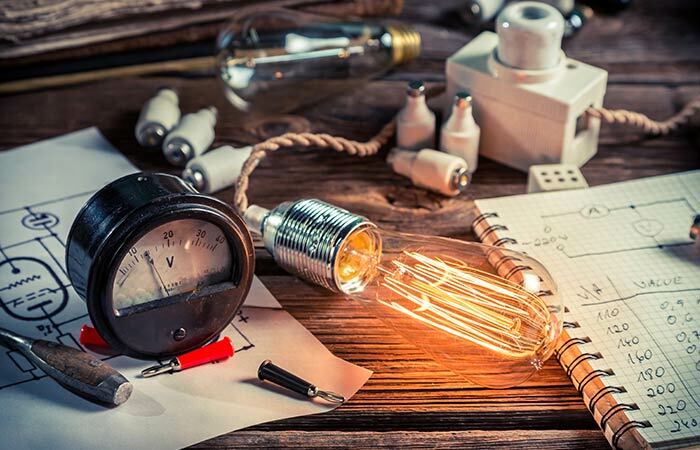 The second will investigate the generation of a timescale combining both the short term stability of earth bound atomic clocks and the long term availability and stability of pulsars. Although PULCHRON has been running for less than 6 months, the results are already extremely encouraging and show how it is possible to explore the synergies between two apparently unconnected fields: astrophysics and navigation. Once the project ends, before the end of September, the data will be available from the GSSC site.